Sunday, 9 September 2018, 8:11a.m. As the road toll tracks close to being the deadliest in nine years, the 10 stretches of motorway set to be targeted by police have been revealed. The New Zealand Transport Agency (NZTA) has generated a list of highways for police to focus on in their patrols in an effort to reduce serious crashes. The analysis takes into consideration historical crash data, traffic volumes, speed surveys and physical road characteristics. NZTA director of safety Harry Wilson was keen to stress they were not necessarily the highways where the most crashes have occurred. "This is not a list of the 'highest-risk' or 'most dangerous' sections of state highway, but rather the sections of state highway where, based on current evidence, targeted enforcement and other speed management measures will deliver the greatest overall safety benefits in terms of crash reduction and the prevention of deaths and serious injuries," Wilson said. The 2018 road toll is 260 after 13 people died last week in a horror stretch. At its present rate, this year's toll will be the fifth consecutive year it has risen, and the highest overall toll since 2009. 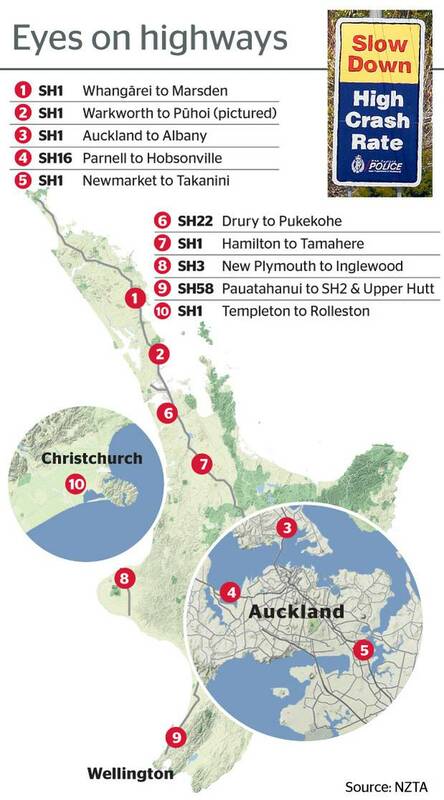 Five of the state highways in the list run through the Auckland region and six of them are part of SH1. Nine of them are in the North Island. The shortest stretch of highway police are scrutinising - a mere 9km - is the only South Island road: Templeton to Rolleston along SH1. Police manager of national road policing Inspector Peter McKennie confirmed officers would be focusing on the stretches of highway they believe will have the greatest impact on reducing deaths. "We always make sure we deploy to risk, in each police district we've got identified high risk routes that we focus on and try to implement management plans for those routes," McKennie said. Earlier this year an independent report commissioned by Auckland Transport identified a "crisis in road safety performance". In 2016, 111 road policing staff were reduced across New Zealand, 70 of those in Auckland, as funding from NZTA to police stagnated between 2015 and 2018. An emergency NZTA injection of funds began to get road policing numbers back up, but nationally they are still nine officers down on pre-2016 numbers. Of 1070 dedicated road policing positions, 1061 are filled. "It is to be expected that the total number will fluctuate as people change positions and taking into account a current police attrition rate of 5.6 per cent," a police spokesperson said. Assessing this funding, the AT Road Safety Business Improvement Review stated: "It is difficult to imagine a less supportive framework to enable police to reduce speeding than the current New Zealand regulatory settings". Greater Auckland transport expert Matt Lowrie believed there was "definitely a passing of the buck going on" between police and government authorities when it comes to enforcing road laws. "There's an issue around the delineation between who's responsible for what, so the police don't seem to bother doing anything about enforcing cycle lanes, bus lanes or anything like that because they say it's AT's job," Lowrie said. "They're [police] as responsible for road safety as anyone, they're actually the ones who have any authority to do anything about it." The Automobile Association also acknowledges the importance of police enforcement in encouraging a culture of obeying road laws. "The simple truth is that people do put on their best driving behaviour if they see a police car and the AA would definitely welcome more officers being out on the road and having a really high presence at the times and places that we know have higher crash risks," AA's Dylan Thomsen said. Meanwhile, McKenzie said improving road safety - and reducing deaths - was a continuous job. "It's not just over summer, year round we will deploy to those routes [highlighted by NZTA]," Inspector McKennie said. "What we'd hope for is a greater level of behaviour of people on the road and not have to issue more tickets."